In cabin weddings in the Smoky Mountains are one of the most affordable ceremony options in the area. Unlike other settings, in-cabin weddings combine both the venue rental and the lodging cost for all of your guests. This can end up saving couples hundreds, if not thousands, of dollars on their Smoky Mountain wedding budget. At Large Cabin Rentals, we offer cabins that can easily accommodate couples and up to 70 of their closest friends and family. When compared to other lodging options, like hotels, there is no denying the affordability of an in-cabin Smoky Mountain wedding. Be sure to check out the Smoky Mountain vacation cost calculator on our website to find out just how much planning a Smoky Mountain wedding in a Pigeon Forge cabin will save you. When talking about a Smoky Mountain wedding, it is impossible to make any list of perks without including the gorgeous views associated with our area. 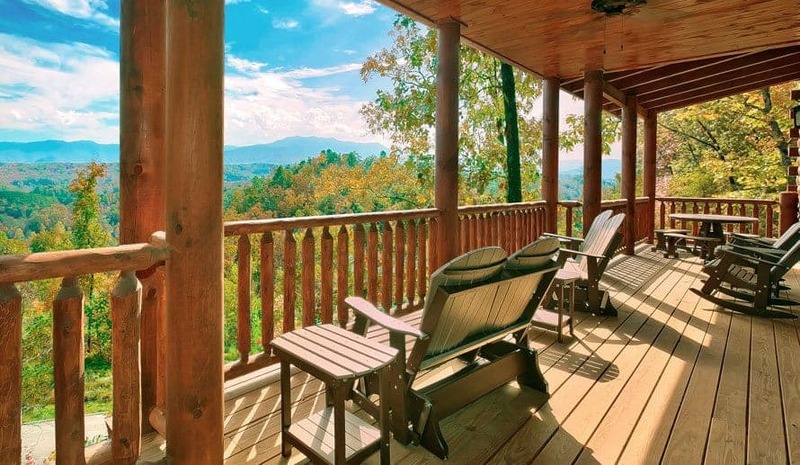 And when combined with the panoramic views that our large Pigeon Forge cabin rentals offer, there is no denying the unbeatable beauty that an in-cabin wedding offers. Whether you and your loved one choose to set up your ceremony on your cabin’s private deck, in the living room in front of the large windows, or just outside with the large cabin in the background, we are sure that you will not be disappointed in the breathtaking views and scenic backdrop that an in-cabin wedding will give to big days and your wedding photos. If you have ever helped one of your friends plan a wedding before, then you know the amount of stress that can accumulate around narrowing down the guest list. Not only do you have to comb through both of you and your future spouse’s friends and families to decide who you want to attend the wedding, but you also have to calculate the cost per person in terms of catering and venue rentals. For example, you may want a total of 50 people with you to celebrate your big day, but your budget may not be able to work with that in terms of the price per plate for the reception dinner or rental chairs for the ceremony. However, by planning a Smoky Mountain wedding in a Pigeon Forge cabin, couples can wave goodbye to much of that guest list stress. Not only do they not have to worry about paying per person for the venue space, but they can also be more creative with the catering plans to reduce that cost as well. Unlike other Smoky Mountain wedding venues, there is no set list of vendors or caterers that couples have to use when planning their big day inside one of our large Pigeon Forge cabin rentals. Weddings can be stressful, there is no denying that fact. Between figuring out the logistics of your guests, food, music, venue, and anything else related to your big day, it can be a big overwhelming. However, one of the many reasons we love in-cabin weddings in the Smoky Mountains is that they are known to be a lot more casual of a wedding setting. We see couples often trade-in fancy ballroom dresses and tuxedos for more laid-back style designs and khaki pants. Therefore, if you are looking for a wedding option that takes less pressure off your wedding and adds more focus on celebrating the love you and your future spouse have for one another, we highly suggest planning a Smoky Mountain wedding in a Pigeon Forge cabin. Besides, it is not the center pieces on the tables that will carry you through a lifetime, it is the bond between you and your spouse and the love you two share that will. Where Can I Pick Up a Tennessee Marriage License? Hours: Monday, Wednesday, Friday 8 a.m.-4:30 p.m.; Saturday 9 a.m.-1 p.m. Address: 300 Pine Mountain Rd. Hours: Saturdays Only 9 a.m.-5 p.m. Hours: Monday-Thursday 8 a.m.-4:30 p.m.
Tennessee marriage license fees are the cheapest for couples getting married in the Smoky Mountains compared to the rest of the state. For out-of-state guests, the cost is only $41 if paying in cash, $43 if you pay with a Visa or Mastercard. For Tennessee residents choosing to have a Smoky Mountain wedding in a Pigeon Forge cabin, the fee is $108, but part of the fee can be reduced by attending a pre-approved marriage counseling course. Be sure to check out Sevier County’s website for more information on Tennessee marriage license fees. What Other Smoky Mountain Wedding Venues are Available? If you still aren’t feeling the idea of planning your Smoky Mountain wedding in a Pigeon Forge cabin, there are still a ton of other romantic wedding venues for you and your loved one to choose from. At Large Cabin Rentals, we are very fortunate to work closely with our friends at Your Smoky Mountain Wedding. If you have any more questions about planning a Smoky Mountain wedding in a Pigeon Forge cabin rental, please feel free to give us a call at the number above. Our team of expert vacation specialists will be more than happy to help answer any and all questions that you and your loved one may have.